I swear Carter is a pinball. He is just determined to get into everything in his path, and shove it all in his mouth if he can. This includes slippers, socks, rocks and if you give him real food he will sit down and sit still long enough to shove it all in his mouth. But then he is off again is search of something else to get into. He likes to keep his hands free to grab anything in his path, so he has perfected this method of carrying whatever he wants in his mouth. 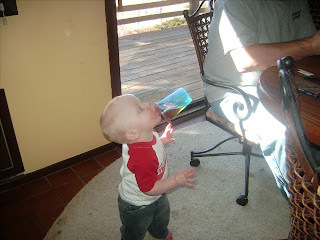 And he can steal Morgan's sippy cup and drink from it while he runs away with it. Here he is caught in the act! Morgan was camera shy today. We made cupcakes and she did a beautiful job decorating them, but did not want to take a picture with them. She did want to take them all home and when I asked if we could keep a few here for TaTa she said "nope, they are my cupcakes."